World champion Marc Marquez claimed his first victory of the season with an emphatic win at the Argentine MotoGP. The 26-year-old Spaniard, winner of five of the past six championships, was edged into second place by Andrea Dovizioso at the opening race in Qatar. But he dominated from pole position at the Termas track and finished 10 seconds clear. Valentino Rossi, 23 years to the day since his world championship debut, pipped Dovizioso to second place. 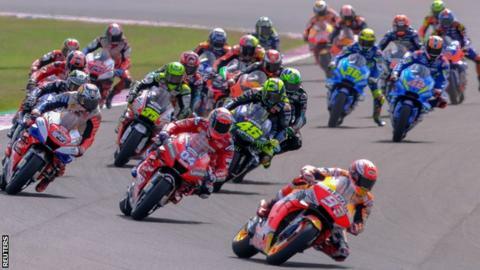 Rossi and Dovizioso switched places 12 times but the 40-year-old prevailed, capitalising on his rival's error on the last lap to take second place on the same circuit where 12 months ago he had collided with Marquez and crashed out. Briton Cal Crutchlow's hopes of a podium position were ended when he was given a ride-through penalty for a jump start. The Honda rider, who finished 13th, said: "If you look at the side camera, which is what they showed me, I moved. But not even a centimetre. "I'm balancing. And they're saying it's a jump start. It's just ridiculous." The next race is the Grand Prix of The Americas and takes place in Austin, Texas, on 14 April.